Posted by thegulfblog.com in Oil, Random. Here is a simple but effective graph of oil prices over the last sixty years or so. The US national debt clock in New York no longer works. This is, however, not due to a technical hitch, but the fact that it has run out of digits to represent the US’ mammoth debt. 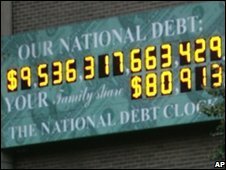 According to the BBC the clock ran out of sufficient digits in September when the US national debt passed the $10 trillion mark. Plans are afoot to add more digits to keep up with the spiralling debt, predicted to rise to some $11 trillion thanks in part to the financial crisis currently gripping the world.